Softcore: Things started slow for the Bold Strategy Cottons in the softcore championship match. After dropping two of the first three games and finding themselves down early in game four, it was looking good for Science of the Lambs, but a momentum shifting catch and a hit would turn the tide and Bold Strategy Cottons would win that game and the next two to all but cement their title. The clock would run out during game seven so despite Science of the Lambs being victorious in that game, Bold Strategy Cottons held on to the advantage and took home the championship! Midcore: First off, without the effort of Anastasiya Tarnauskaya in their opening game of the evening, Highly Dodgy would not have even found themselves in a position to win it all. Down to herself against four in a winner-take-all game, she would come out on top. Highly Dodgy was then able to mount a comeback in the championship match after finding themselves quickly down two games. They would get on the scoreboard in game three, but after game four found themselves down three games to one. With time working against them during game five, Highly Dodgy quickly needed a win. They would get it with just under three minutes remaining on the clock, enabling game six to start and giving Highly Dodgy all the chance they would need to force the greatest two words in sports: game seven! Riding the wave of momentum they had gathered winning the last two games, Highly Dodgy showed no fear despite finding themselves down early again. After a well timed flurry knocked out a couple key players from Balls to the Wall and seized the advantage for Highly Dodgy, they wouldn't look back and eventually would take the midcore championship! 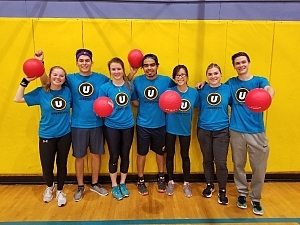 Congratulations to both Bold Strategy Cottons and Highly Dodgy for your respective victories and thank you to ALL of the teams for making yet another successful dodgeball season. Most of the times a championship is won credit goes to what happened during that game, rather than the events that led to it. Without the incredible game 5 comeback in their opening game, Highly Dogdy's championship run never would have happened. With the time limit over, down 4 players to 1 and the match tied, Anastasiya locked in and picked off each player one by one. After an epic 1v1 rally, Anastasiya was able to sneak a ball right off her opponent's lower leg for the win! Great performance leading to a championship run. Eduardo was catching balls left and right Wednesday night, including an awesome game ending catch to preserve Highly Dodgy's second sweep of the night.